Are you getting harassed by creditors over the phone and mail? If it seems like your financial future is hopeless, there is a solution to your problems! Affordable Phoenix Bankruptcy Lawyer Ryan Dorn offers free consultations and debt evaluations. Find out if a chapter 7 bankruptcy is right for your debt relief. Chapter 7 bankruptcy is the fastest and easiest type of bankruptcy to pursue. This experienced chapter 7 bankruptcy attorney in Phoenix can help you achieve financial stability. Call our Phoenix debt relief team for low cost debt relief in Phoenix. Reasons vary for being under financial strain and many Phoenix residents struggle to make ends meet. As a result, bankruptcy is often a legitimate way to reboot your financial future and eliminate crushing debt. Creditors’ Lawsuits, car repossessions, wage garnishments, and constant collection attempts are just a few problems hunting individuals, families, and businesses in Phoenix and surrounding communities. Having debt causes anxiety. Phoenix Bankruptcy Attorneys are here to help you become stress free. It does not matter if you are facing a foreclosure, a repossession, or have incurred insurmountable credit card debt, give Phoenix Bankruptcy Attorneys a call at (480) 263-1699. Bankruptcy is our business. As such, we are a high-quality, low-cost bankruptcy focused law firm. Therefore, our lawyers work chapter 7 and chapter 13 day in and day out, and can provide you with the experience needed to guide you through the process of filing. Plus, our Phoenix-based bankruptcy law firm will be with you every step of the way while declaring bankruptcy. We also serve in North Phoenix, South Phoenix, Central Phoenix, Downtown Phoenix, and all throughout Arizona. In addition, find out if you meet the requirements for chapter 7 or chapter 13 bankruptcy filing. We also offer free bankruptcy consultation and debt evaluation where our debt relief experts will administer the bankruptcy “means test” and determine if you qualify for chapter 7 or chapter 13 bankruptcy. Furthermore, our Phoenix bankruptcy attorneys will be by your side every step of the way as you file for bankruptcy protection at low-cost rates. Additionally, our Phoenix bankruptcy attorneys serve individuals and businesses in proceedings under all Bankruptcy Chapters, including Chapter 7 and Chapter 13. As a result, our Arizona bankruptcy law team prides itself in the fact that we can provide high-quality bankruptcy service at inexpensive rates for our clients. We also offer a free bankruptcy consultation and debt evaluation. We also offer free bankruptcy consultations in one of our Phoenix area offices and initial evaluations by telephone with one of our experienced attorneys. By all means, call us today and set up your free consultation. For example, maybe you are facing a foreclosure, a repossession, or have incurred insurmountable credit card debt. Our attorneys can go over these issues with you locally here in Phoenix and let you know whether bankruptcy is a good option for you. Remember, bankruptcy is only one option, and an experienced bankruptcy lawyer can develop comprehensive and creative solutions to your debt problems. Furthermore, bankruptcy is our business, let our years of experience and know-how work for you to get you the debt relief that you are seeking. Lastly, contact us today to see if you qualify for bankruptcy. We will determine what chapter of bankruptcy filing best fits your needs. Our attorneys will help you every step of the way. 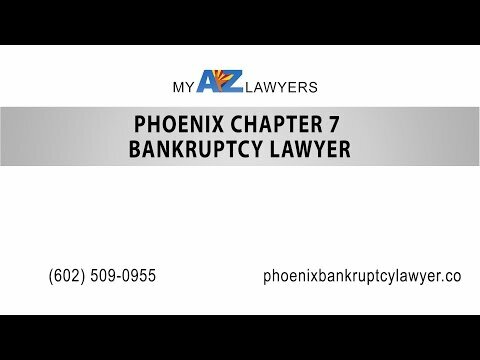 Our Phoenix bankruptcy attorneys are located in Phoenix, Arizona, and serve bankruptcy clients in Scottsdale, Phoenix, Glendale, Gilbert, Queen Creek, Tempe, Mesa, Chandler, Pleasant Valley, Avondale, Cashion, Casa Grande, Surprise, Prescott, Marana, Tucson, El Mirage, Peoria, Sun City, Sun City West, Tolleson, Youngtown, Sedona, Flagstaff, and Pima, Pinal, and Maricopa County.